Dog lovers rejoice as Diamond Dogs by Net Entertainment (NetEnt) is about to see you delve into a canine world where you will witness the luxurious lives enjoyed by celebrity dogs from high society. These dogs enjoy the finer things in life as they live in kennels as impressive as some players homes, eat from diamond encrusted gold bowls and devour the juiciest steaks around. While such snobbery may make your blood boil a little inside, it’s well worth hanging around as these posh pooches like to show their more generous side by lavishing you with big wins that will have you barking all the way to the bank! 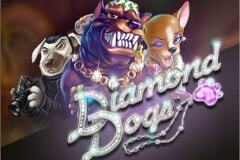 The Diamond Dogs video slot boasts a structure of 5 reels with 4 rows and 25 adjustable betting lines. While you can play for free below with no download needed, rubbing paws with VIPs of the dog world doesn’t have to be a costly event as there is a max bet of £50 for those of you who prefer playing with real cash. The reels are framed with gold and diamonds to reinforce the luxurious surroundings that these pooches are so used to with sparkling crowns and collars visible to see, however the barking sound that echoes out every time you hit the spin button will get on your nerves after a while - so much so that you’ll probably be grabbing the muzzle and hitting the mute button. As you rub paws with the world’s wealthiest canines, you could find yourself photographing the posing pooches on a red carpet for cash prizes in the Celebrity Photoshoot bonus and Chihuahua’s could take a shine to you and present you with the gift of free spins! There are countless breeds of dogs in existence so NetEnt had lots of options to choose from when deciding which posh paws would feature on the pay table, and in the end, they opted for a Bulldog to act as the Wild symbol while a Chihuahua acts as the Scatter symbol and the photographer acts as the Bonus symbol. The Bulldog acts as the most powerful VIP in this doggy world as it has the special powers to replace all symbols aside from the Scatter and Bonus symbols and it will see you “woof” in celebration of wins of up to 10,000 coins. While Ace to Jack doggy tabs act as the lowest-paying symbols of all and could easily have been replaced by different breeds of dogs, the other four symbols make up for this as they have been brilliantly designed. You’ll see a kennel complete with palm trees and a swimming pool which is worth up to 600 coins, a VIP fire hydrant for only the richest dogs to release on that is worth up to 240 coins, a gold diamond encrusted bowl with three juicy steaks inside and two flutes of champagne to wash them down with also see you claim up to 240 coins, while finding rawhide bones wrapped in a ribbon will see you rewarded with up to 120 coins. Personally, I can’t stand Chihuahua’s due to their annoying barks, however they certainly grew on me while playing this free Diamond Dogs slots game as they lavish you with free spins and huge wins. Three or more Chihuahua’s appearing at once see you trigger the free spins game where you will receive 10 free spins with all wins being tripled in value alongside impressive Scatter pays which vary in value. Three see you scoop 4x your stake, four of them appearing at once see them reward you with 25x your stake, while the rare moments that five of them appear at the same time see you claw in 100x your stake. Just like famous celebrities in our world, those in the canine world also love to get all glammed up to strut down the red carpet and pose for the cameras, and you could benefit from each snap taken. To activate this Celebrity Photoshoot bonus game, you will need to land three or more Bonus symbols (the photographer) at the same time. You’ll then see twelve glammed-up pooches on the red carpet dressed to nines with you having to pick one to photograph. If a cash prize is revealed once you take your snap you will get to take another with this continuing until you reveal a muddy paw print which ends the feature. This unique dog-themed slot takes you into the world of pampered pooches and you’ll struggle not to become their biggest fans as the incredible bonus features that have been included promise that you’ll have plenty to bark about!